Travel with Kevin and Ruth! : Getting ready to shut things down. There's not really a lot to do to shut things down around here. Besides, it turns out that they're actually keeping the campground open until the end of the month but there won't be any services. The water will be turned off and the washrooms and shower building will be closed. Nobody will be in the office and store although someone will come around a couple of times per day to make sure anyone camping pays their fees. There will still be electricity at the campsites though. But, we've turned off the electric to the overflow camping area and put away the trash cans. Today, we'll get the picnic tables up there offset so that water and snow melt drains off of them. Not sure if there's any benefit to doing this, but that's what they want done. Oh, and we've got a few projects on the go, but I've had some help! We had a crew of inmates come and do some work yesterday, and they're coming back again today. One of the things the campground is getting done is the building of a new maintenance garage! These are the three sheds that have housed all of our tools and equipment. So, those three sheds are being moved, and in that spot will be a nice new 20 x 40 foot garage with a concrete floor and everything. That will make the campground managers job a whole lot better when he has to fix anything! So if we return next year, that will be a benefit. Anyhow, our inmate helping crew (4 guys) got all three of these sheds ready to move. Dismantled the steps and lower siding and moved the concrete out of the way. All three sheds are built onto skids, so a big tractor or something will be able to drag them away. And they'll be dragging them up to our fenced compound. But that compound has been more of a dump than anything over the years and a lot of it was overgrown with weeds and crap. I should have taken a pic of it. So our work crew moved all the heavy stuff out of the way, stacked all the leftover firewood, and weed whacked all the overgrowth. They're coming back today to finish the job. The sun is setting very early now. Or at least very early compared to July when it was still light out at 10:00pm. Now, the sun goes down around 7:30pm. 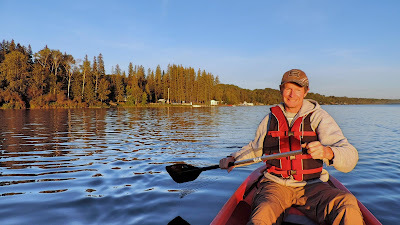 It was a nice calm evening so we went out for a sunset paddle in a canoe. The sun is getting low in the sky. Kevin, out for a canoe ride. Only five more sleeps and we're outta here! Glad you're getting more help. Boy, it's almost over - On to the next great adventures. Job well done. It was nice to have them here to help with some of the heavy work, I am sure I could have helped Kevin with it but we would have been all week trying to clean up that whole compound area. This worked out much better and I was able to work on a border for the flower bed and also do some painting. Wish I could get some inmates to come and work around here. Especially if they worked shirtless. We really need someone to was our motorhome. Do you think you could send someone down to Idaho?